Understated Strokes member creates a largely understated masterpiece, revealing a wider range of influences than in his full-time job. Being a member of the Strokes other than Julian Casablancas must be frustrating. True, you’re in one of the coolest bands in the world -- and you had a hand in creating the album that’s pretty much defined the decade. But since the hype and suspense that followed the release of Is This It in 2001, you’ve had to sit back and wait for your frontman to come up with his next set of garage-rock gems, your own creative thoughts and lyrical ideas rebuked by a singer seemingly almost in complete creative control of every song. It was all too much for guitarist Albert Hammond, Jr. By the time the Strokes’ third long-player, First Impressions of Earth, had hit the shelves in January 2006, he was already hard at work on his first solo album, channelling all the song ideas he’d intended for the Strokes into Yours to Keep, an album that was edgy, endearing and accessible. In fact, almost everything that First Impressions of Earth wasn’t. And now, while Albert Hammond, Jr. is onto his second solo LP and the Strokes aren’t due to return to at least the end of 2009, the other members have itchy feet and have started doing their own thing, too. Enter bassist Nikolai Fraiture, forever seen as ‘the quiet one’, who has demonstrated with Time of the Assassins (recorded under the psuednym-of-sorts Nickel Eye) that his influences mostly lie earlier on in the ‘70s. While both the Strokes’ and Albert Hammond, Jr.’s albums largely sound like genuine products of New York post punk circa 1978, Time of the Assassins is a richer, more varied affair, pillaging from mid-‘70s funk, country and rock. Recorded in London, with help from UK band South, as well as the Yeah Yeah Yeah’s Nick Zinner and Regina Spector, it in some ways shares the qualities of Albert Hammond, Jr.’s solo efforts. In particular, there’s Nikolai’s delivery, which sounds like he’s trying to ape the New York drawl of his full-time band’s singer. It’s not a bad voice, but he doesn’t quite pull it off. Nevertheless, he is chiefly a bassist, and subsequently the album contains some pretty cool basslines. On "Intro" you can hear echoes of "Superstition"-era Stevie Wonder, "You and Everyone Else" is a mid-‘70s stomp for the indie dancefloors, and "Brandy of the Damned" has one of those hooky basslines Blondie occasionally employed when they tried their hand at disco. But it’s not all about the bass. "Fountain Avenue" is an acoustic moment that almost mirrors "Blue Skies", the Lennon-esque centerpiece to Albert Hammond, Jr.’s debut -- here, depending on your preference, it’s more Neil Young or Leonard Cohen. And "Where the Cold Wind Blows", with Regina Spector on piano, is a beautiful, plaintive moment that could enrich any future Strokes album if given the chance. Time of the Assassins does have its Strokes-esque moments, though. On the impatient, post-punk "Dying Star" we get the hint of what First Impressions of Earth could’ve sounded like had Muse made more of an impact in the US and Julian Casablancas wanted to avoid claims of plagiarism. 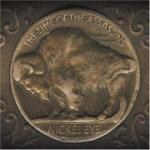 Whether we’ll see another Nickel Eye album anytime soon remains to be seen. With Nikolai’s full-time band reconvening this year for album number four, it’s likely each member’s solo career will be put on hold. But for now, Time of the Assassins is an interesting insight into the creative mind of another member of one of the decade’s most important bands. It’s in no way a substitute for a fourth Strokes record, although if songwriting was to become more of a democracy in the Strokes, maybe their next album could see them once again upping the bar. Nikolai, let your voice be heard.